The India China relationship in 2017 became defined by Doklam, now synonymous with the 73 day military standoff (between June and August 2017) in the tri-junction with Bhutan and defused through proactive diplomacy. It brought into perspective the fractured relationship between the two Asian giants on the global stage and increased fears of China’s growing unilateralism as it inexorably broadens its interests and sphere of influence, especially in South Asia. Much water has flowed under the bridge since then. In the talks held between Foreign Minister Sushma Swaraj and her Chinese counterpart Wang Yi, they agreed that Doklam proved that rebuilding of “mutual trust” and improved “strategic communication” were imperative. The two countries decided to work afresh on confidence building measures to manage border flare ups in the 20th round of talks between special representatives on the border issue. In fact, soon after Doklam, when President Xi and Prime Minister Modi met at the BRICS summit in Xiamen, China’s Ambassador to India, Luo Zhaohui, wrote in The Hindu, pressing for a “Treaty of Good-Neighbourliness and Friendly Cooperation”, to ensure that “China-India relations do not derail, confront, or go out of control, and make the Himalayan region a new highland for Asia’s development.” It is a line few in New Delhi will find problematic, but many will suspect. For most Indian observers, rarely have China’s assuring pronounce-ments matched its actions. The trajectory of India-China relations in 2018 is still weighed down by news of 1,800 Chi-nese troops camping at Doklam, sporadic reports about the diversion of the Yarlung Tsang-po, the upper stream of the Brahmaputra river and the polluting of its waters as it enters Arunachal Pradesh, and the ‘wars’ being fought in newsrooms of both countries, with the latest salvo coming from the Chinese defence spokesperson stating “India should control its border troops” to avoid a repeat of Doklam. This warning ties in with the assessment in New Delhi of the threat of a future military confrontation with China, especially since President Xi’s message to the People’s Liberation Army at the all-important, 19th National Congress of the Communist Party of China was “to become a modern fighting force by 2035, the world’s best military force by 2050; and, intensify its combat readiness by focusing on how to win wars.” New Delhi has indeed read between the lines. Even as New Delhi grapples with the uneasy predictability of dealing “with another Doklam like incident” it has to accept that the confrontation, most importantly, tested (in extremes) the idea of ‘regionalism’ in South Asia, traditionally seen as India’s sphere of influence. The impact of shrewd Chinese investments in the neighbourhood, re-energised by the grand “One Belt One Road” (OBOR) project, is steadily changing the geopolitics of the region. “Creditor imperialism” and “sharp power” are some of the many terms being used to de-scribe how China is spreading its influence. On the ground it is increasingly evident that China, through its economic bullishness, is trying to impose itself culturally in South Asia, and this should worry India more than the military brinksmanship. Because shared culture and history have always been the links that legitimized India’s status as a natural leader of South Asia. At the peak of the Doklam crisis, I found myself in Sri Lanka for an academic exchange. Interestingly, my impressions of how Sri Lanka dealt with the “Chinese debt trap” came more from anecdotes and frank opinions exchanged with locals: taxi drivers, tuk tuk operators and shop owners; than from academic discussions. The extent of Chinese inroads into Colombo is obvious in the streets, where you spot spas that have hoardings only spelled out in Mandarin, in souvenir shops where Chinese tourists outnumber other nationalities and in the advertisements for scholarship for Sri Lankan students to study in China, to help “develop their country when they return” by joining “infrastructure projects funded by China”. I was intrigued when the tuk tuk driver, doubling up as a tour guide, told me that if I wanted to see the “real Colombo”, we had to “leave China town”, where, according to him, my ho-tel was located. There was no sarcasm in his tone, he was just stating facts. In fact, he gen-erously pointed out to the many 5-star and 7 star projects including the Shangri-La Hotel, coming up as part of the Colombo Port city project, which is funded at US $ 1.4 billion by the Chinese. While he complained about how Chinese workers were all over the area, he also sympathised at the hectic pace of construction they had to keep up with after delays halted the project due to local protests. His commentary was insightful about how locals perceived “the Chinese imposition” and their assessment of the payoffs. Our first stop was the famed Buddhist Temple, Gangaramaya, which is known for its confluence of Sri Lankan, Thai, Indian, and Chinese architecture and is one of the most important and oldest temples of Sri Lanka. 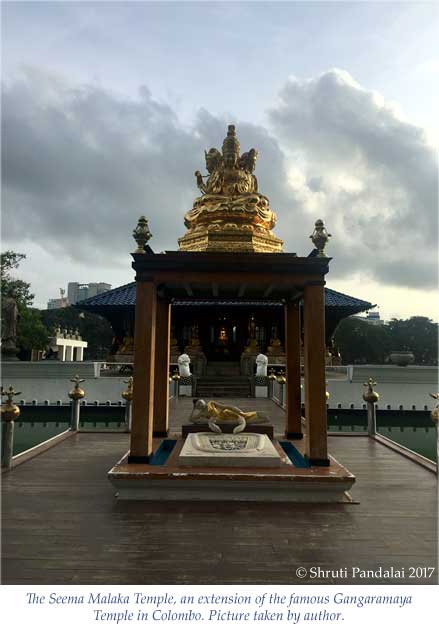 It extends its complex to host a library and a museum and then further down the road to the serene Seema Malaka Temple, which sits in the middle of the Beira Lake and serves as a meditation centre. “It is where PM Modi offered his respects in May’, added my local guide helpfully. (Modi was the chief guest at the UN-recognised 14th International Vesak Day in May 2017 meant to mark the birth, enlightenment and passing away of Lord Buddha). Yet, what caught my attention was the entrance to the Gangaramaya temple complex that also houses the museum and library. 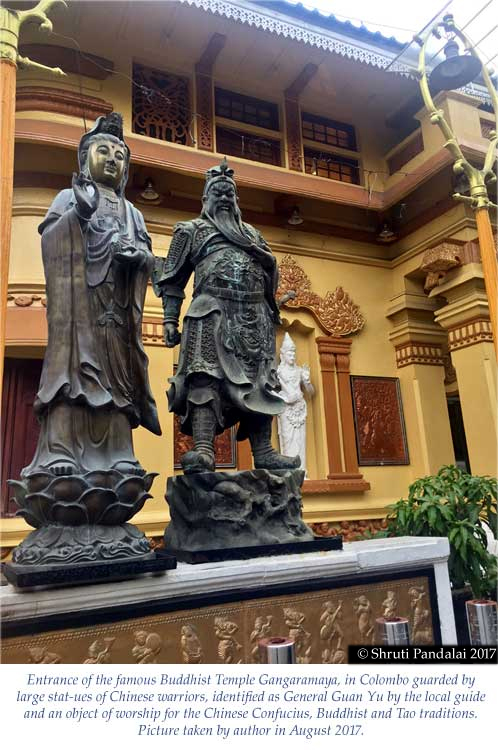 It is guarded by large statues of Chinese warriors, identified as General Guan Yu by my guide, and said to be an object of worship for the Chinese Confucius, Buddhist and Tao traditions. According to China Daily, Guan Yu was a prom-inent historical figure in Chinese history, and was a famous general during the Three King-doms period. The general was later deified in Chinese culture and is reverently referred to as Guan Gong or Guan Di and has come to symbolize brotherhood, integrity, loyalty and righteousness. There are many statues of the general within the temple complex, along with idols of Hindu deities like Lord Ganesha, Goddess Lakshmi and Lord Nataraja. There is an entire museum cluttered with artefacts predominantly from China alongside collectibles from South and South East Asia. There is also a “fully equipped Buddha Chamber constructed by a devotee from Quanzhou in China”, advertised prominently for tourists. Since there are no explanatory plaques on how these collections came about, except that they belong to the collection of the Temple priest, one had to rely upon the guide’s limited inputs. My tuk tuk driver pointed out that the statues had been around for a while and added with a shrug “Madam, China has so much money they can do what they want.” There is no escaping this truth for India. Senior colleagues in Colombo’s strategic community, however, nuanced this argument in informal chats. They reminded me that Sri Lanka is a proud, independent nation, which has acted in its best interests and balanced its relationship with New Delhi and assuaged its concerns while trying to secure the best deal from Beijing for its economic turnaround. However, one expert pointed out that “one can’t hold on to nostalgia in relationships, the ground is shifting with the next generation, because of the systematic cultivation by Beijing of the political ,military and business elite.” China’s push to insert it-self culturally into South Asia and give roots to its influence beyond the economic arena can be understood through its efforts to make inroads into the" Buddhist project in South Asia”. The Belt and Road, it has been argued, needs to be seen in this context. This is reinforced by the fact that China’s $3 billion investment in Nepal is aimed at linking OBOR with Buddha’s birthplace in Lumbini. 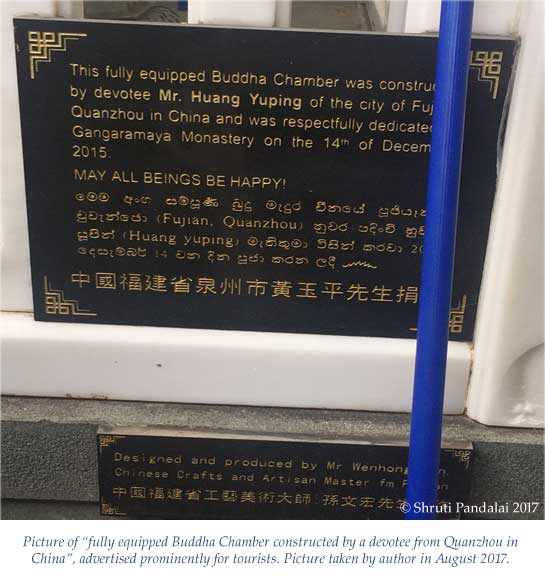 Further, the Chinese hand in Pakistan’s attempts to revive the ‘Gandhara trail’ by linking Lahore, Taxila and Peshawar as Buddhist pilgrimage routes cannot be missed. In fact, it has been speculated that it is on Beijing’s insistence that, Islamabad sent sacred Taxila relics to Sri Lanka for a public exposition during Vesak day (day of enlightenment of Buddha) and even received a delegation of 40 high ranking Sri Lankan Buddhist monks scholars, led by Parliament Speaker Karu Jayasuriya, earlier this year. India being the land of the Buddha, has never had to lay claims to its spiritual heritage, yet it certainly has felt the need to do more to reclaim its legacy. In 2011, Prime Minister Manmohan Singh’s government hosted the first Global Buddhist Congregation and then joined hands with Myanmar in 2012 to convene a conference of Buddhist scholars in Yangon. From the beginning of his term in 2014, Prime Minister Modi has often evoked Buddhism in his diplomacy and outreach to leaders in the neighbourhood in Bhutan, Nepal and Sri Lanka and in building bridges with countries like Myanmar, Japan and Korea. However, as 2017 has proved, Modi’s hopeful idea that “shared heritage” could smoothen tensions between Delhi and Beijing has not fructified. If India needed more examples of China’s attempts at cultural appropriation in South Asia, it need look no further than across the border. The Pakistani media was abuzz with comments and even criticism of what they labelled as the “CPEC Biryani ad” showcasing the all-weather Pakistan China Friendship. The roll out of the $ 42-62 billion China Pakistan Economic Corridor has seen a an influx of Chinese companies and expats into the country, making sceptics fear that apart from issues of economic viability, Pakistan will soon become a Chinese colony. The advertisement for a biryani masala, so carefully choreographed, seems to have all the answers for the critics of the CPEC. It opens in a wealthy neighbourhood in Lahore, with women going about their routine, as a Chinese expatriate observes them from her home. When her husband expresses concern and asks the wife if she has tried to make new friends in the city, she reminds him of the striking cultural differences as they dig their chopsticks into bowls of noodle soup. They continue to eat in silence when the wife has an idea. The following 45 seconds show the Chinese woman first shopping at the supermarket and then bustling in the kitchen as she follows a Biryani recipe translated to Mandarin. The advertisement cuts to the now headscarf-wearing Chinese protagonist carrying biryani in a bam-boo steamer basket and crossing over to her neighbours. At the doorstep, she mumbles a soft “assalamu alaikum” leaving her Pakistani neighbour pleasantly surprised. The ladies of the house welcome her with quintessential warmth and cheek-pulling hospitality while praising the biryani made by their “Chini padosan” (Chinese neighbour). Wiping her tears away, the family matriarch soothes the overwhelmed protagonist by telling her that she is always welcome in their home.” The timing of this advertisement was crucial, as Pakistani economists point out that both Islamabad and Beijing are trying to ensure that ‘burgeoning resistance’, especially from the poor , who fear that CPEC is another attempt at land grabbing, does not flare up. While it would be premature to look at the competition for influence in South Asia as a zero sum game, Beijing’s intervention in India’s neighbourhood in 2017 has set off alarm bells. Nepal elected a “China-friendly government”, which has promised to use Chinese investments to build up infrastructure including links across the Tibet-Nepal border. The signing over of Sri Lanka’s Hambantota port to China and Maldives finalising a free trade agreement with Beijing are all parts of China’s bullish embrace of the region. Ex Maldivian President Nasheed, visiting India in August, had warned of the presence of Chinese warships in Male, while saying that Doklam had put smaller countries in the region in an uncomfortable spot, with most not wanting to pick sides. This is the harsh reality in South Asia today that India has to contend with. India’s recent activism with partner countries in South Asia bilaterally and through regional groupings like BIMSTEC is a step in the right direction and needs to be sustained. In a majority of conferences in New Delhi, the most common refrain heard from South Asian experts (except Pakistan), is that “India needs to do more”. This is positive news for India. Despite China’s strategic push, economic dole outs and attempts at cultural appropriation, it is India which South Asian countries have expectations of and feel comfortable enough to complain to. The relationship goes beyond the transactional. Yet, India would do itself no good if it took these expectations for granted. As we head into 2018, a former Foreign Secretary’s words after the de-escalation in Doklam carry an important lesson. She said: “if there’s a clear winner, it must be Bhutan, for it won peace.” The Doklam template was one of mutual respect between Bhutan and India and that needs emulation in all aspects of India’s dealings with the countries in the region. It is clear that the Chinese military is not the only threat India needs to watch out for in South Asia. China’s meticulous and bullish economic and cultural embrace will have long term implications for the region.